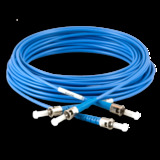 Applied Fiber Telecommunications manufactures large core fiber optic assemblies that are used in many life science applications. Long years of research and design development have produced fiber that meets the requirements of many critical delivery systems and is used in dental, medical, surgical and diagnostic systems. The large core fiber is essential in unique imaging and illumination environments. Our clean room packaging will insure a product that is produced to your required standard. Request a Quote for your In-stock or Custom project by contacting our experienced sales team.